The entryway’s steel frame features a thin tray for stashing keys, and supports a flat screen TV opposite the sofa. 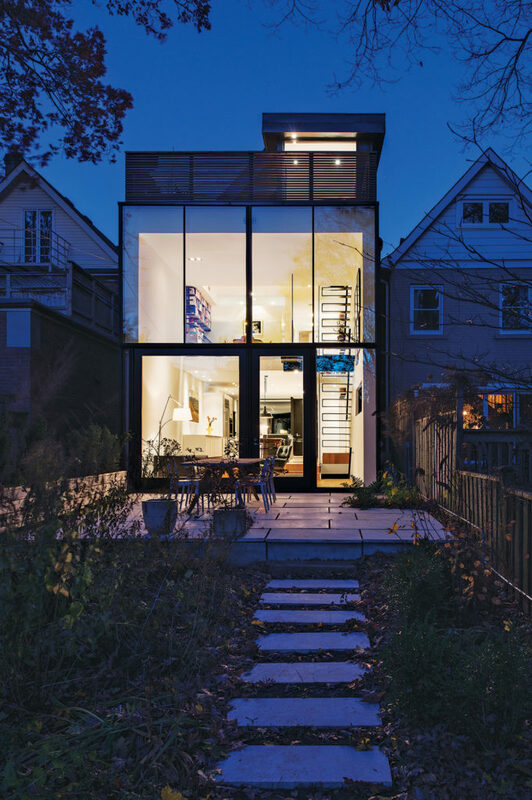 The house blends into the neigh­bour­hood, yet stands out from it, thanks to surprising glass insertions. 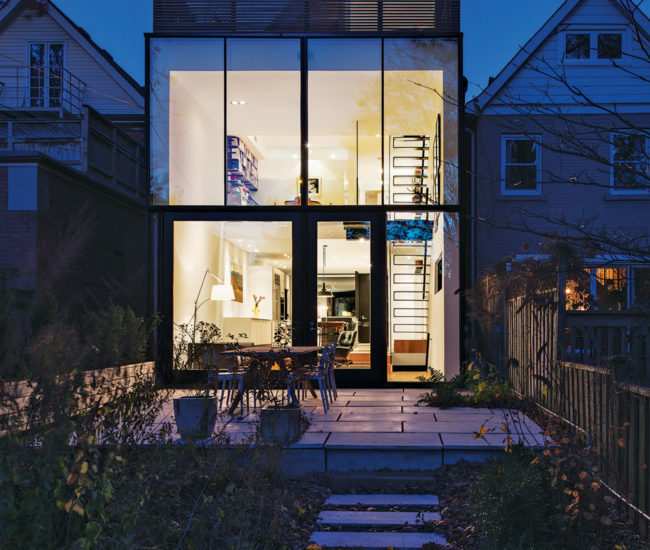 The fully glazed rear facade leads out to a patio whose flagstones are made of reclaimed marble cladding from Toronto’s First Canadian Place. 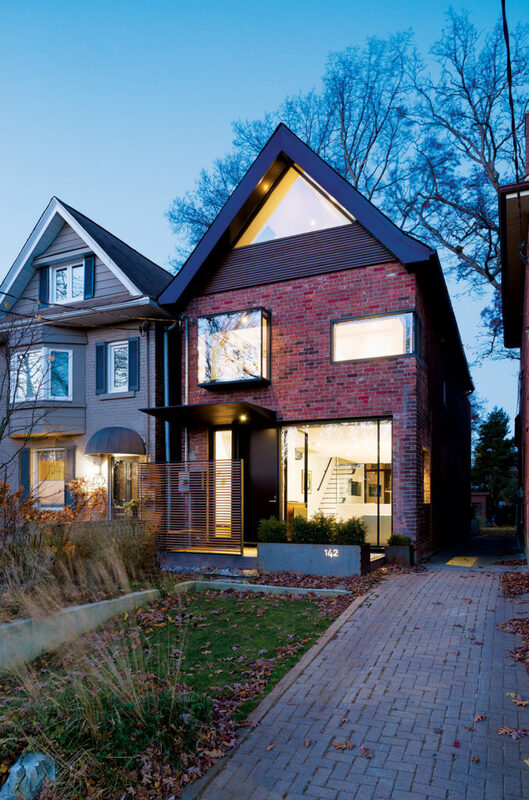 On a quiet street in Toronto’s east end, one renovated house blends in with the early 1900s builds that surround it – until you get closer. 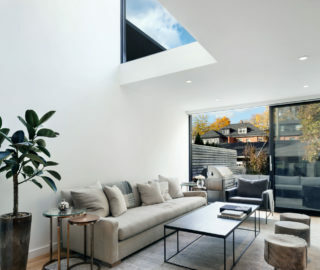 Then its surprising insertions begin to materialize: A squared-off bay window protrudes from the second floor, and the attic’s glazing forms a crisp triangle. 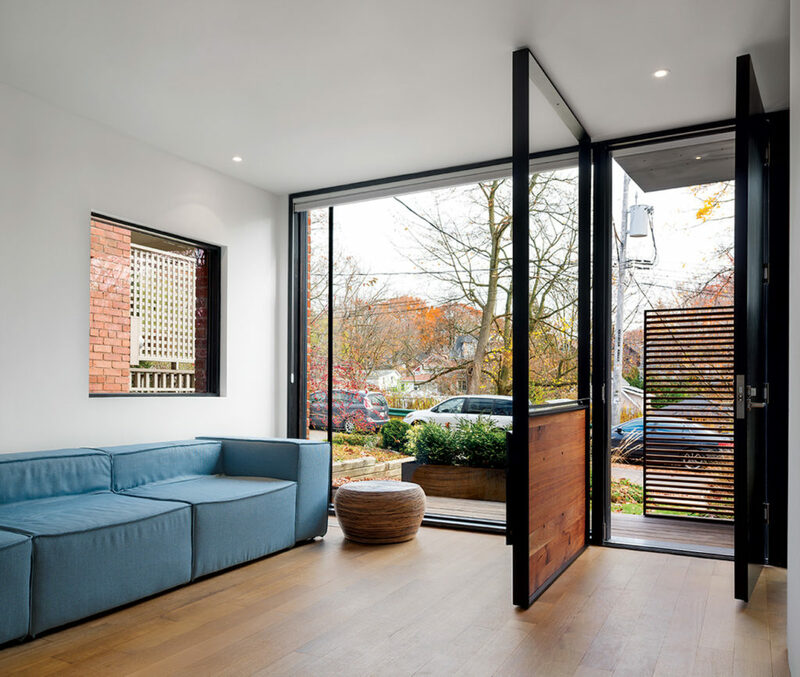 A steel cantilevered canopy and an ipe screen enclose the entrance and the expansive front window, which also enhance the central motif. 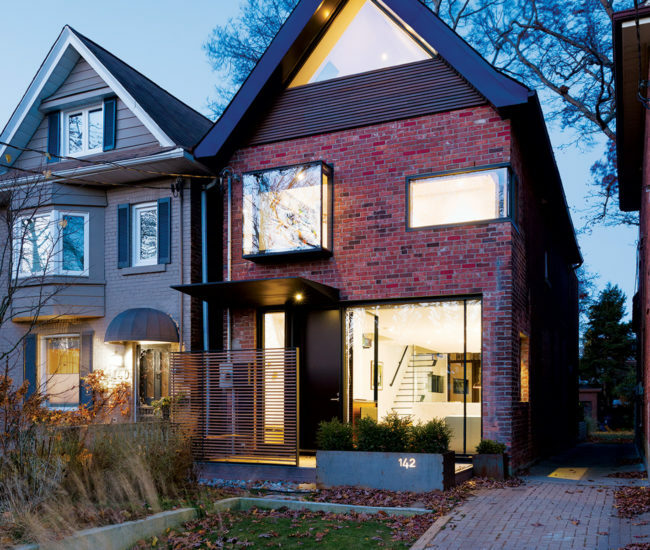 Local designer Johnson Chou fashioned the 178-square-metre, three-storey house to read like a series of frames. 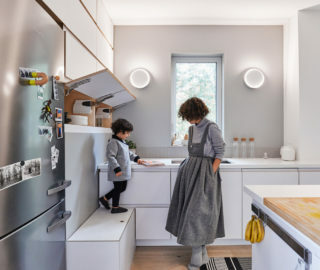 From virtually every angle, openings provide unexpected perspectives for owner Joseph Siahou, his wife Emma, and their two young children. 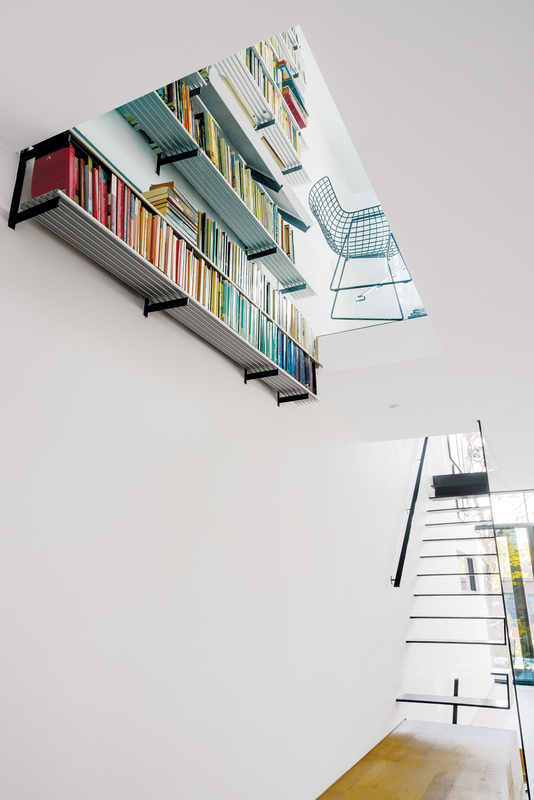 The aluminum bookshelves on the first floor appear to burst through the glass floor of the second. 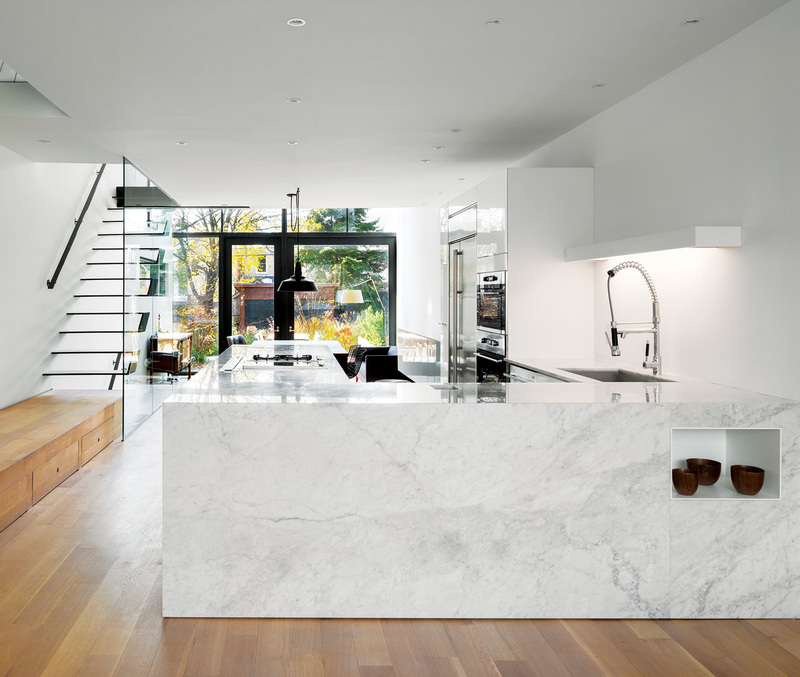 From the double-height living room, a view to the dining area and the second floor’s glass-enclosed landing. The white oak flooring planks were cut on an angle to achieve a unique grain. 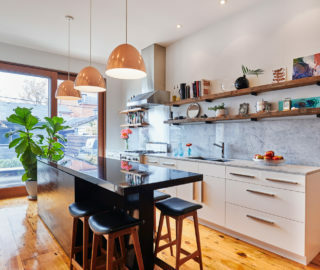 The revamp constitutes a major departure from the home’s previous life as a cramped three-bedroom residence sliced in half by a stair. 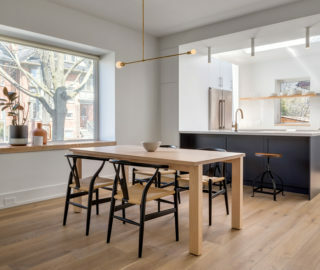 After buying the place sight unseen, Siahou called Chou (who had designed both locations of Siahou’s Blowfish Restaurant and Sake Bar) during the couple’s first panicked walk-through. Chou got straight to work, knocking down walls and relocating the stairs to one side. He inserted a floating staircase made of 13-­millimetre-thick steel plates welded into rectangular boxes; inspired by Donald Judd, one of Chou’s favourite artists, the steps further the frame theme. Though Chou transformed the attic into a master bedroom and ensuite by levelling the ceiling, he kept the peaked window as a frame for the tub. 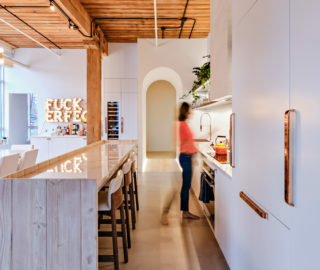 Nooks carved into the kitchen’s custom island frame interior accents. 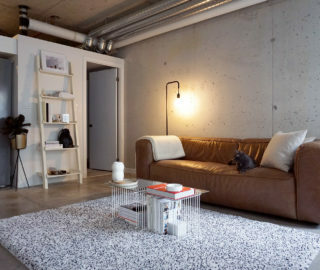 Got something that’s suitable for Designlines?